Paul Jarvis is an injury doubt for this afternoon. Doncaster Knights will be looking to bounce back to winning ways against Nottingham at Castle Park today (2.30pm). Knights produced an error-strewn display in last Saturday’s defeat at Ealing and director of rugby Clive Griffiths is expected to make changes – though with several forwards on the injury list his options are limited. The Welshman, who could also lack the services of full-back Paul Jarvis, is likely to recall fly-half Declan Cusack to the starting line-up. 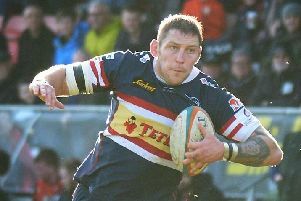 The Irishman added more of a cutting edge when replacing Simon Humberstone in the final quarter at Ealing. “We had to give Simon a start sometime but on the day things didn’t go as well as he would have liked, but he wasn’t the only one,” said Griffiths. The Green and Whites have had arguably the toughest start to the season of any club in the league and have played all three of the sides above fourth-placed Knights. They will not lack confidence having won in Jersey and also run second-placed Yorkshire Carnegie close on their travels. It will be the first time that Griffiths has come up against new Nottingham coach Ian Costello at this level. “I’m sure he will have looked at footage of our game at Ealing and seen where we went wrong and I’m pretty sure that they’ll be a bit of traffic coming down the same channels,” he said.